Based on the proven deep-vee hull of the Sabre 36 Express MKII, the Sabre 36 Sedan is offered in a standard Fly Bridge Sedan version, as an extended Hard Top version or as a Sedan without fly bridge. This versatile approach allows clients to select the model which is just right for their boating lifestyle. 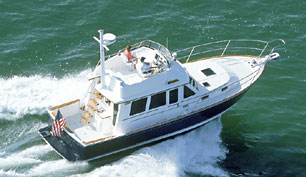 The 36 Fly Bridge Sedan is equipped with twin Yanmar 6LP 315 hp diesel engines. Optionally Yanmar 6LY 370 hp engines may be selected. Cruise speed with standard engines is 18 knots and with optional engines, 24 knots. Top end speed with the optional engines is 30 knots. The interior of the 36 Fly Bridge Sedan is finished in hand crafted American Cherry. Her layout includes a private owners stateroom forward, a large head with circular acrylic shower enclosure and a full galley. Above the engine room is a spacious and airy salon with a lower helm station and sliding door to the starboard side deck. Wide side decks with a molded in non skid pattern provide a sense of security for crew moving about on deck. She is outfitted with the finest deck hardware: Large diameter handrails, stainless steel portlights, highly polished hatches from Lewmar all add to her beauty and functionality. From the cockpit a gently sloped staircase leads to the spacious and comfortable fly bridge. The Sabre Design Team recognized a need for an extended hard top. This unique option extends the existing fly bridge sedan’s hard top to form a cover for the yacht’s aft cockpit. With this overhang, the cockpit becomes an extension of the yacht’s salon, offering a comfortable space in which to relax while underway or at rest. Whether it is the sun or the rain you are trying to avoid, this option dramatically increases the versatility of the Sabre 36 Sedan. A sliding acrylic hatch covers the stairs to the command bridge and can be drawn closed to keep the rain away from the cockpit. This opening in the hard top also provides convenient sight lines from the upper helm to the port aft corner of the transom, during docking maneuvers.